So many books are made into movies these days; Jane Eyre, the Great Gatsby, Wuthering Heights, and most famously, Harry Potter series. However, at often times, those movies are harshly criticized because they fail to carry out the greatness of the books. Among many of those movies, one is an exception: Gone with the Wind. The movie Gone with the Wind successfully visualized many essential aspects of the book which earned as much fame, if not more, as the book itself. This time, The UOS Times will focus on only two sides of the movie; visual splendor and the message of hope even in the most desperate of the times. 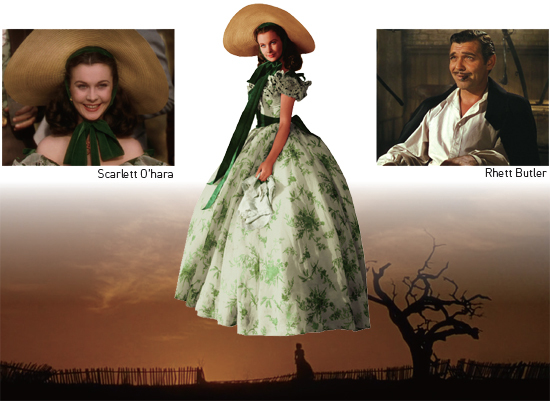 The main character Scarlett O’hara is an attractive woman from a rich and respected family, living in Georgia, the South of America. While she is living the prime of her life surrounded by beaus, the Civil War breaks out in 1861. Her prosperous family gets robbed of its fortune. Her home, Tara, and Atlanta are completely destroyed. All of her rich friends whom she used to share dances and laughs with starve, barely surviving by doing minor labors. However, she refuses to be hungry and poor. Scarlett starts a lumber business despite disapproval of every single one of her acquaintance. Regardless, she manages to make her business productive and lives up to her promise that she will have fried chickens and all her clothes in silk. In the midst of the war, however, Scarlett has a dynamic love life. First, she marries Charles Hamilton on a whim because Ashley Wilkes, the person of her childish admiration, rejects her confession. Second time, she marries Frank Kennedy for his money; she desperately needed to pay high taxes on her land, Tara. Lastly and finally, she marries Rhett Butler who loves her just as she is, but she self-destructs her happiness because she cannot let go of her Ashley. In the end, after facing two tragic deaths of her child with Rhett and her most faithful ally and friend Melanie, she realizes her true love was Rhett all along. She tries to confess her true love for Rhett, but he leaves, tired of waiting for her love. Nonetheless, once again, Scarlett does not give up, resolved that she will make him fall in love with her again. Gone with the Wind ends here, but one can imagine that she will make herself succeed in regaining Rhett’s love. The reason behind Gone with the Wind’s lasting fame and fandom is unquestionably the perfect visualization of the book. To state the obvious, books usually give detailed descriptions of characters’ appearances and even clothes to give better ideas about who they are. When movies come short of the books to fit such portrayals, people get frustrated from not being able to see those characters alive. Not to mention, when movies do not do the book characters justice, it distracts the audience from concentrating and loses the original impression. Gone with the Wind, however, is one of few movies that satisfy imaginations from the books. The characters are as if they jumped out of the book. The main characters of Gone with the Wind are two: Scarlett O’hara portrayed by Vivienne Leigh and Rhett Butler by Clark Gable. It is known that the moment Vivienne showed up for casting, she was hired, and the producers had to beg to Clark to take the role. The result was an immense success. Vivienne is just like Scarlett: “an arresting face, pointed of chin, square of jaw. Her eyes were pale green without a touch of hazel, starred with bristly black lashes and slightly tilted at the ends. Above them, her thick black brows slanted upward, cutting a startling oblique line in her magnolia-white skin.” Not only the appearance, but the fact that she enjoyed wearing green dresses and bonnets which made her already green eyes sparkle more than ever was shown in the movie. Rhett did not lose his essence as well: “He was a tall man and powerfully built… a man with such wide shoulders, so heavy with muscles… animal-white teeth below a closeclipped black mustache. He was dark of face… and his eyes were as bold black… There was a cool recklessness in his face and a cynical humor in his mouth…there was undeniably a look of good blood in his dark face. It showed in the thin hawk nose over the full red lips, the high forehead and the wide-set eyes.” Clark, despite his rejection at first, made possible for Rhett and his cool and masculine disposition to come alive. The book Gone with the Wind was written in 1936 and the movie was out in 1939; those who know American history must immediately realize it was during the worst economic crisis of USA in its entire history ─ the Great Depression. The Great Depression came after the Golden Age of 1920s, which was the most extravagant and ostentatious time of USA. The Depression followed by the decade believed as the time of everlasting fortune and parties crushed American people to abject desperation. Gone with the Wind was timely, for its temporal setting is similar to the actual background of the book. The book portrays how peaceful and lively the Southern America turns to ashes by the war, hopeless to even think about reliving their past glory. The people of south, according to Rhett, only have of cottons, slaves, and arrogance. When the real war hits them, their world disappears, unable to be restored ever again.